I’d heard about The Gannet, mainly by reputation and via tales of their restaurant award victories, but not had much of an impetus to visit as I’m rarely in their part of Glasgow. However, I ended up sitting next to three of the team that work there, including chef proprietor Peter McKenna and restaurant manager Kevin Dow, at the Sasu Laukkonen dinner at the Edinburgh Food Studio at the start of December. Now I must declare to being someway short of sober on that occasion. From what I can recall one of my opening gambits was focussed on the chasm in quality between Edinburgh and Glasgow’s cocktail bars. This is to a certain extent true, but my twattish delivery could have been better judged. Anyhoo, it brought their restaurant more directly in to my crosshairs so I took the opportunity to visit just before Christmas. I was warmly greeted by Mr Dow who was on absolutely top form throughout. He displayed the kind of menu knowledge and sage advice you’d want wherever you were dining. His recommendations, of which I sought a number, were flawless. He marshalled the team to expert effect. The 5/5 awarded below for service was richly deserved. I was lunching during the working day so sampling their cocktail list was out of the question, but I had to give one of their mocktails a go given my jejune insults about the city’s general mixology skills. I sampled a brightly aromatic pine fizz. 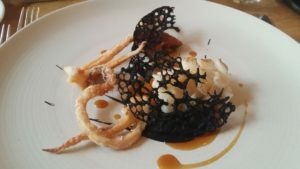 From the seasonally driven a la carte, I started with the Shetland squid served with ink, confit chicken wing and juices. It was topped with a crisp, lacy wafer coloured with more of the squid ink. This was accomplished cooking with the chicken particularly flavourful. Mr McKenna’s fellow chef proprietor Ivan Stein was at the helm, today. 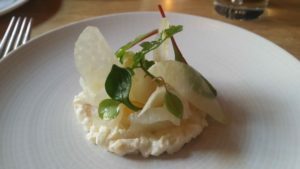 He popped up between starter and main with a little bonus dish of their whisky-cured, cold-smoked halibut served with tartare of the fish, kohlrabi, orange and pine. I recall with mild horror harshly smoked white fish at both the Champany Inn and Twenty Princes Street that was simply a waste of good fish, hence my reluctance to order this dish in the first place. The Gannet’s halibut was of a much more delicate and pleasing nature, so consider me converted to the joys of measured smoking of this type of fish. 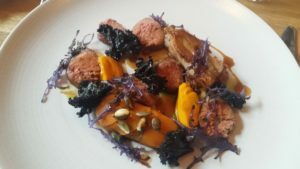 The main course brought together belly, shoulder and slow cooked lamb in harmonious union with butternut squash, kale, and potato fondant. I didn’t get much from the cumin sauce, but I’m happy to account for it as contributing smartly to the overall well-judged seasoning of the dish. This was daintily presented and stylish cooking, showcasing well-curated ingredients. The squash-wrapped shoulder was a particular winner. I was a very happy chappy. So overall, The Gannet was a great way to start the reviewing year of 2017 in fine style. 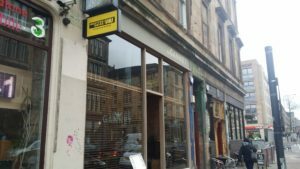 It’s comfortably the best place at which I’ve eaten in Glasgow and has spurred me on to try some of their likely rivals for top spot in the local pecking order, several of which are very nearby. I’d strongly recommend it to you and look forward to visiting when I can put their drinks list through its paces, some time later in 2017.